Memphis, Tenn. – August 10, 2016 – The U.S. Fish and Wildlife Service (FWS) today released its report on 2016 Trends in Duck Breeding Populations, based on surveys conducted in May and early June by FWS and the Canadian Wildlife Service. Overall duck numbers in the survey area are statistically similar to last year and remain steady. Total populations were estimated at 48.4 million breeding ducks in the traditional survey area, which is 38 percent above the 1955-2015 long-term average. Last year’s estimate was 49.5 million birds. 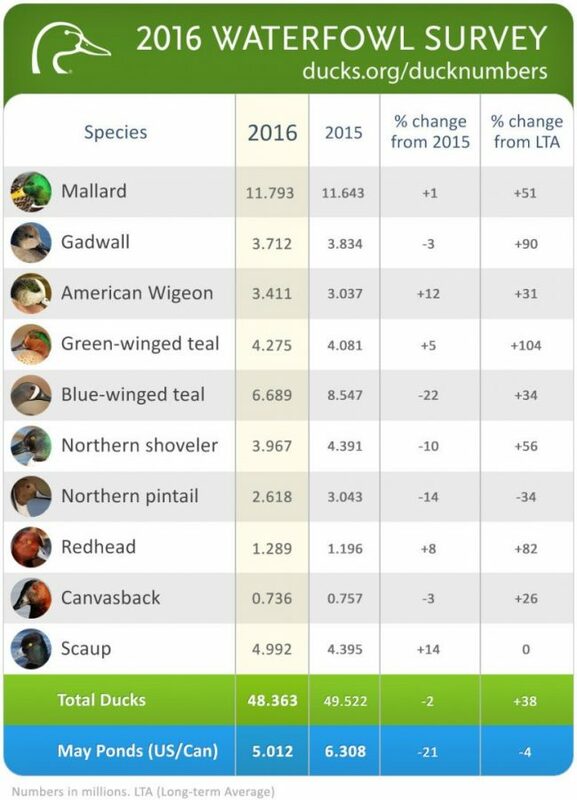 The projected mallard fall flight index is 13.5 million birds, similar to the 2015 estimate of 13.8 million. The main determining factor for duck breeding success is wetland and upland habitat conditions in the key breeding landscapes of the prairies and the boreal forest. Conditions observed across the U.S. and Canadian survey areas during the 2016 breeding population survey were generally poorer than last year. The total pond estimate for the U.S. and Canada combined was 5.0 million, which is 21% below the 2015 estimate of 6.3 million but similar to the long-term average of 5.2 million. “In light of the dry conditions that were observed across much of the northern breeding grounds during the survey period, it is reassuring to see that the breeding population counts were little changed from last year,” said DU Chief Scientist Scott Yaich. “But, with total pond counts similar to the long-term average, and with hunting season and winter mortality being a relatively small part of annual mortality, it’s not surprising to see that populations largely held steady. “What’s not reflected in the report is that there was fairly significant improvement in habitat conditions after the surveys were completed,” said Yaich. “In some key production areas, heavy June and July rains greatly improved wetland conditions. This could benefit brood rearing and the success of late nesting species, as well as give a boost to overall production through re-nesting by early nesting species.